BOM is used for driving the working bodies additional agricultural equipment tractor T-40 and put in the transmission housing and the clutch, and passes it in a synchronous shaft. Independent gear drives rear and side VOMov mounted on two roller bearing, and it is in the engaged state with the clutch gear shaft PTO clutch. The cone and gear synchronous drive are mounted on the ends of the hollow spline shaft synchronous. Synchronous drive gear shaft always in an engaged state with the bevel gear output shaft PPC. Synchronous shaft is positioned on two ball bearings. Transmission between the front wall and the flange cup gasket body disposed, which serve for adjusting the clutch gap during assembly of bevel gears in the assembly. Coupling adjustable tractor PTO switch T 40 is splined PTO front edge. The sleeve holder includes two - outer and inner. The inner hub is fixed between the drive gear can be shifted and outer engageable with splines of the drive gear hubs. When activating PTO outer ring biased lever with a fork shaft rear switch. Independent drive PTO is activated by moving the holder forward. Independent PTO drive is activated only when the PTO clutch is disabled. This drive gives the rotation regardless of whether idle or tractor is in motion. A synchronous drive is activated by shifting back clips from the original neutral point. In this case, the torque from the engine crankshaft to the PTO shaft is transmitted by the clutch. Synchro PTO drive is activated only during a full stop and the clutch out. 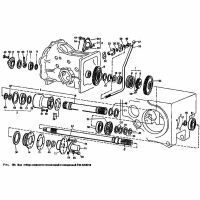 Side PTO put the left in the bore of the clutch housing, and requires it to activate agricultural machinery / machines that are front and on the left or on the right side of the tractor. PTO driven shaft side turns by means of two ball bearings. The shaft is formed with a bevel gear during the assembly side shaft meshing with the driving bevel gear. Coupling between the housing and the flange cup placed gaskets, necessary for regulatory clearance under the hitch tooth bevel gears. side PTO drive is put into the body itself clutch basket. The switching gear wheel mounted on the spline shaft and is disposed between two driving gears. She, in turn, moves freely on the shaft splines and engages with the drive gear rims.